Roy Keane and Alastair Campbell have an interesting relationship. 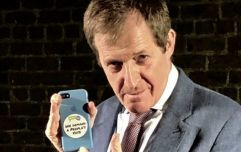 Author and political aide Alastair Campbell was this week's guest on Ireland Unfiltered with Dion Fanning and he spoke about a whole range of topics, from the UK turning into a "global laughing stock" over the Irish border to the benefits of having a second referendum on Brexit. But he also spoke about a time he managed to annoy Roy Keane with some of his comments. Dion: Was your temper or your anger a way of releasing those frustrations and those obsessive ideas and thoughts as well do you think? Do you think you fed off your temper a bit? Dion: You had no temper? AC: What temper you talking about? Dion: This is like Roy Keane, if you talk to Roy Keane he'll tell you he never lost his temper, he doesn't know what people are talking about. AC: Is that what he says? AC: Oh, I'm not telling you. Dion: Anything to do with Alex Ferguson? AC: I'll tell you exactly what it was. It was because he saw that I talked about a previous conversation on the television! And he said, is this one gonna appear on television? So there you go, Roy! You can watch the full exchange from the 1:01:00 mark below. You can listen to the fifth episode of Ireland Unfiltered, Dion Fanning in conversation with Alastair Campbell by simply subscribing here, and you can use #IrelandUnfiltered to join the conversation on social. Ireland Unfiltered, brought to you in partnership with Carlsberg Unfiltered, is available everywhere you get your audio and on YouTube every Tuesday.